“Respect for People” has come into vogue in the last year or two as people have finally realized, after decades, that focusing on Lean tools yields Fake Lean. The “Respect for People” principle and Lean leadership have been my area of interest for more than 20 years. These topics have been the central theme of every book that I have written. I suspect many people think that I write books to profit from the Lean movement, and the more books you write, the more money you make. Right? Neither assumption is correct. It is true that I have written a lot of books. The image at right shows the first 10 books that I wrote between 2003 and 2009. I have written five more books since then. It is always nice to make money from ones efforts, but the actual reason why I’ve written so many books is for this simple reason: to help people (especially, managers). I could see long ago that managers were in trouble. They were practicing Lean wrong, Fake Lean, and causing great harm to people: employees (layoffs), suppliers (price cuts), customers (poor quality), investors (short-term gains at the expense of the long-term), and communities (factory and office closures). Therefore, my view has always been that it is of great importance to understand and practice Lean management in ways that do not harm people. Other people may think that I write books to promote the Lean movement. That is not correct. For decades the Lean movement was focused on Lean tools, resulting in Fake Lean. It is more appropriate to refer to the last 30 years as the “Fake Lean movement.” I saw no good in that. 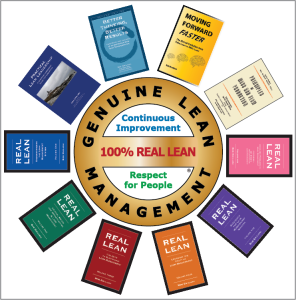 Instead, I have been promoting the REAL Lean movement, meaning the skilled practice of both “Continuous Improvement” and “Respect for People.” There have been only a handful of us who have done this consistently for 20 or more years. We were largely ignored. The books I have written reflect my own learning over the years, and they do not say the kinds of things that everyone else is saying. The established names and organizations that have long dominated the Lean movement have been unable to create the kind of work that I have done. And, it’s not just me saying that. The feedback that I receive most often is that which recognizes my writing as different from all other authors; that my views on Lean thinking and practice are creative and innovative. And, I would not have been able to create such work had I been part of the organizations that dominate the Lean movement because of their biases and preconceptions. You can think of my work as craft-brewed beer compared to factory-brewed beer. I am the small, local micro- brewery that uses the best ingredients, taking time and great care to make something one can savor, competing against the giant corporate brewers who use the lowest cost ingredients and rely on slick marketing to drive sales. Sales is what matters most to them. Quality is what matters most to me. I have a sincere appreciation for Lean heritage – from Taylor through Woollard to Toyoda and Ohno – and a unyielding commitment to quality in the books I author. When you buy my books, you buy into a set of shared values. Every book was written in the same tiny shop located adjacent to the city where Lean management first came to America in 1988: Hartford, Connecticut. That has given me access to some of the most accomplished sensei and successful Lean leaders. This, along with other important factors, such as my own practice of REAL Lean in industry, results in authenticity. The Fake Lean movement has had its day. Join the REAL Lean movement.